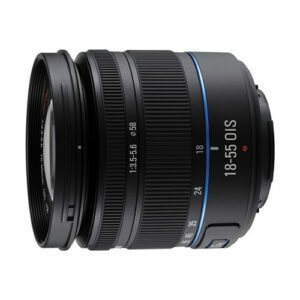 Lens Description: The black Samsung 18-55mm f/3.5-5.6 OIS Compact Zoom Lens is a standard-length zoom lens that provides a 35mm-equivalent focal length range of 27.7-84.7mm, covering wide-angle to portrait-length perspectives to suit working in a wide variety of shooting situations. It supports the intuitive and efficient i-Function control, which allows you to control many of the camera\'s manual settings simply by pressing the i-Function button and rotating the lens ring. The settings adjustments can be previewed in real time and modified at any time during shooting.